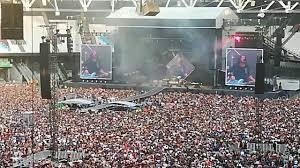 The very best live performers, in the history of stadium gigs, have an amazing ability, that being the talent to perform to many thousands of people whilst making it seem that they are performing just for you. Freddie Mercury, David Bowie, Mick Jagger, Noddy Holder, Bruce Springsteen and Fish all had/have that spine tingling aura of making any gig, regardless of the amount of people in attendance, a personal and intimate affair. And to that list Dave Grohl and the Foo Fighters must be added. 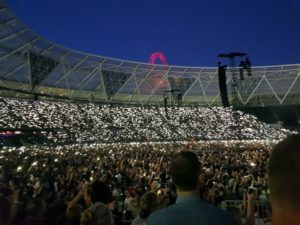 With a reputation of being the loudest and best rock band on the planet at the moment The Foo’s, at the London Stadium last Friday, did nothing but confirm and enhance that view with a show that simultaneously filled the huge space of the Olympic stadium whilst making 75000 people seem like they were in a club of 750. But before we talk about the main event mention must be given to two excellent support acts that added to and enhanced the whole experience. First up was Frank Carter and The Rattlesnakes who performed a half hour set of pumped up enthusiasm designed, as Carter himself said, ‘to try and upstage Dave Grohl.’ Second on the bill were Wolf Alice, who performed an eclectic set, perhaps without the theatrics of The Rattlesnakes, but with perhaps more polish. In both cases their sets worked both as an introduction to these stars of the future and as a wonderful entree to the Foo’s. 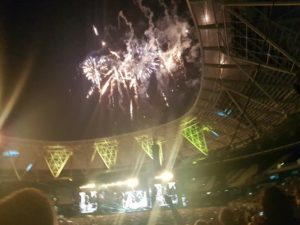 But, as ten past 8 arrived, onto the stage exploded Grohl and his band to take us through a near three hour tour de force of tight as a drum musicianship, screamingly loud and raucous rock and roll, a cacophony of great song followed by great song. Starting with All My Life the band played loud, hard and brilliantly, driven with immense showmanship taking the 75000 people in the crowd on a wave of Foo Fighters awesomeness. 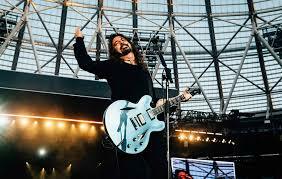 Dave Grohl, it is apparent, genuinely wants everyone to have a great time, he knows you’ve spent a lot of hard earned cash on this event and he’s determined to make sure it is money well spent. Highlights? To be honest from start to finish it was one long highlight. The set list was balanced between classics and new material with, as part of the band intro’s, an interesting selection of covers including ‘Your The One That I Want’ from Grease, Guns and Roses ‘Its So Easy’ and a mash up of the vocals from Van Halen’s ‘Jump’ and tune of John Lennon’s ‘Imagine’ (no, honestly it really does work.) 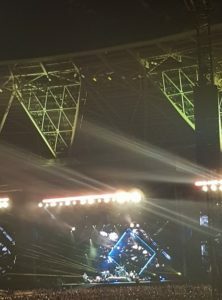 And here is the great thing about Dave Grohl; this is a man whose greatness should entitle him to an ego the size of the stadium he is playing, but which never appears. 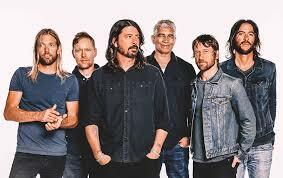 Dave is happy, as when drummer Taylor Hawkins took vocal duties for a cover of Queen’s ‘Under Pressure’ with Grohl on drums, when the other members of the band take the spotlight. After all The Foo’s are a pretty unique band in being mates who’ve played together for 25 years or so and have remained mates. I really don’t think these guys would care if they were playing to 10 people in your local pub or 75000 in a stadium, they’ll still enjoy themselves and that is all that matters. Excellent review my friend. Wish I’d been there.